This time Criterion presents us with a fascinating film famous in Europe but almost completely obscure here. Dozens of Italian crime movies never shown in this country are in Phil Hardy's Encyclopedia of Gangster Films. They concern themselves with internal Italian problems, mostly the post-war experience dealing with the Mafia, the Camorra and other forms of organized crime. Unfamiliar terms like razzia are thrown about. As the Eurohorror picture was thirty years ago, this is prime territory for investigation. 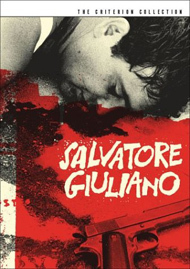 Salvatore Giuliano isn't quite a semidocumentary and isn't really a neorealist film. It's an unusually responsible political exposé, a distanced examination of a key scandal in Italy's recent past. The bandit Giuliano remains a peripheral figure while we're shown the real workings of society: corrupt deal-making, collusion and systematic cover-ups. The fascinating extras on this disc support the claim that Francesco Rosi's strange crime film is the predecessor of political 'exposé' pictures like The Battle of Algiers and "Z". 1950. Sicilian authorities kill bandit Salvatore Giuliano but some reporters doubt the official story. 1943. When the allies take Sicily, a separatist movement is encouraged. In 1945 bandits and other criminal elements take part in harassment of the Italian authorities, culminating in the 1947 massacre of Communist May day celebrants. When Sicily is ceded partial independence, the politicians abandon their Mafia and bandit helpers and begin to hunt them down. Francesco Rosi shot Salvatore Giuliano in the same towns and with many of the same people who witnessed its events ten and fifteen years earlier, and he captures a high sense of realism in the images of sun-drenched streets and high mountain passes caught by his distanced, emotionally neutral camera. But the real innovation is his absolute refusal to fictionalize the still-debatable events of the bandit's short and violent career. Giuliano helped liberate his country, only to be tracked down as a scapegoat for the general corruption of the government, the police (the carabinieri) and the Mafia bosses - many of whom became politicians after the war. Rosi and his writers invent nothing, and instead show a credible truth by presenting their scenes (all based on recorded fact) in an order that reveals the truth behind complicated events. Giuliano was a secretive person, so Rosi never shows him speaking and we never get a good look at his face when he's alive. We start at the death site, where the official story doesn't jibe with witness testimony. The authorities create a fiction to paint Giuliano as solely responsible for the misery of the area. The story uncovers the facts - he was a bandit and killer before he turned political, and his ability to organize resistance to Italian authority was utilized by the Sicilian separatists. A promised amnesty never materialized, and the bandits continued robbing and kidnapping from the hills. Without ever saying so, or having actors deliver position speeches or interpretative exposition, the story shows how all the parties involved - civil authorities, the carabinieri, the Mafia - allowed Giuliano to flourish while he was useful to them. They continued to shield him because he knew too much to be allowed to bear witness to their complicity. When it finally came time to do Giuliano in, his killing happened through a string of betrayals and double-crosses. Salvatore Giuliano is almost all political dissection - there's no romance or family intrigue, just the facts of a scandalous case. There's quite a bit of action showing how the bandit raiders maintain their hold on the territory. They invite comparison with any guerilla organization, the kind that can harass an occupying army indefinitely. At the end of the show, we are given a re-examination of the death of Giuliano and the police involvement in making it look like something it was not. Salvatore Giuliano hit Italian audiences in 1962 with a shock of truth no censors could refute, and it invented a new kind of social agitation film that's rarely been done as well. If one expects Sophia Loren it will seem like nothing is happening, but fans of politically-aware pictures will be mesmerized. Criterion's DVD of Salvatore Giuliano succeeds mightily at the task of presenting us with the top picture of a previously unfamiliar genre. Little of the politics of the region was ever reported in the U.S., so the brief narrations that interrupt the film from time to time might be inadequate to understanding what's going on. A Peter Cowie commentary is very helpful with general observations about the picture (Rosi's recreation of old newsreels, etc) and the historical background. I had no knowledge of the separatist movement. Coppola's Godfather movies take place in Sicily at this time and don't mention it at all. The Neopolitan director and his assistant Tullio Kezich give us new interviews discussing the film, and an hour-long docu covers Rosi's career. He's lauded and famous in Europe but not well-known here, probably because his films are so specific to Italian issues. Rosi prides himself on being a recorder of and witness to his times. The other lauded directors avoided this kind of material - even the greats either stuck to Marxist generalities, or filled their neo-realist films with sentimentality. There's also a startling Italian newsreel from 1950 showing the crime scene and the locals, and even the prisoners in the iron cage of their courtroom dock. It's very powerful after seeing the film, and not just because Rosi's recreations are perfect. The newsreel itself dissembles the truth, editorializing on behalf of the 'valiant' police and repeating the false official story of Giuliano's shooting down to every inconsistent detail. Michel Ciment offers a good liner note essa, and Scorsese, Coppola and Fellini each weigh in with a couple of paragraphs of comment. There's an original trailer identifying the key production company as Galatea, which brought us many Mario Bava films and the original Hercules series. The Criterion DVD producer credited with this daunting assignment is Abbey Lustgarten. This is prime prestige DVD-making. 1. Pisciotta is played by familiar actor Frank Wolf, who just a year before was an American acting in Roger Corman movies like Beast from Haunted Cave. Moving to Europe, he graced such great pictures as Elia Kazan's America, America and Sergio Leone's Once Upon a Time in the West. 2. After Salvatore Giuliano, it's interesting to contemplate just how objective or slanted generally-accepted history becomes, after films like All the President's Men or The Right Stuff. I expected my father to like The Right Stuff, as he loved the book. But he had to turn it off. He felt the movie misrepresented the astronauts (who he new as test pilots) as clowns and comedians, oversimplified every issue it didn't ignore, and inflated Chuck Yeager's image shamelessly.